ACADIA NAT’L PARK — Park officials are hopeful that maintenance crews will be able to perform limited winter snow removal operations, including the plowing of Ocean Drive and trailhead parking areas, after requesting guidance from Washington about the use of entrance fees to fund the work. The breakthrough comes ahead of a possible major winter storm forecasted for the coming weekend. And, Friends of Acadia and the NPS reached an agreement last week to allow area volunteers to continue to groom cross-country ski trails here, conditions permitting, as the partial federal government shutdown continues. Since the beginning of the shutdown on Dec. 22, nearly all year-round of employees of the park have been on furlough. There has been no trash collection, restrooms have been closed, and no visitor information services available. A handful of rangers and maintenance workers deemed “essential” by statute, have continued to work, but without pay. U.S. Coast Guard personnel, TSA screeners, and other federal workers have also been required to work without paychecks. Although most of the Acadia National Park Loop Road is closed in winter anyway, one lane of the Ocean Drive section is normally kept free of snow and ice. Because plow drivers have been among the 75 people furloughed, Ocean Drive has been closed recently on several occasions due to snow or freezing rain. Meanwhile, an “In-Kind Donation Agreement,” now will allow members of the Acadia Winter Trails Association (AWTA) sponsored by FOA to set track and smooth ski trails as they have in years past. In general, volunteers have been precluded from working in national parks due to the shutdown. “We heard from a lot of community members who were surprised that the shut-down would also preclude volunteerism. FOA appreciates the efforts of Acadia National Park to pursue this agreement, and we are pleased that our dedicated volunteers will now be able to resume providing this service to the park and its winter visitors,” said FOA President and CEO David MacDonald. It permits the volunteer operation on nearly 30 miles of carriage roads that have traditional been groomed. Those routes include Eagle Lake, Aunt Betty Pond, Witch Hole, Brown Mountain, Upper Hadlock Pond, Amphitheater Loop and the upper and lower Around Mountain areas. FOA acknowledges in the written agreement that the donation is a gift and that the organization will not receive any benefit offered in return. AWTA volunteers only work when snowpack and weather conditions allow. To date there has been insufficient snow depth for operations although the possibility of a major snow storm later this week could change that. Ground on the carriage roads must be frozen and there must be at least six inches of frozen base snow for grooming to begin. The process involves packing down the snow, setting a parallel track for classic cross-country skiing, and a large smooth swath for skate-style skiing. Walkers and snowshoers are encouraged to use the remaining portion of the carriage road to avoid damaging the groomed tracks. AWTA crews use a variety of sleds towed by snowmobiles or tracked grooming equipment. 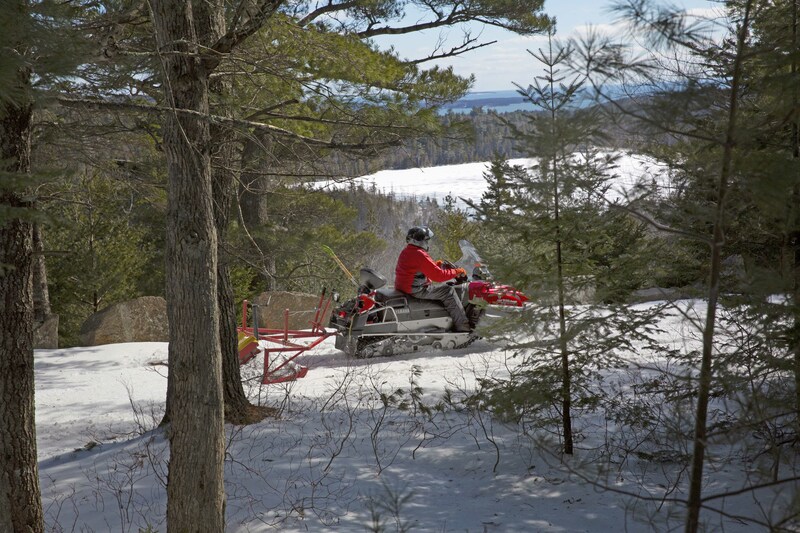 Ski grooming updates are posted regularly on Friends of Acadia’s Facebook page. In winter, fat-tire bikes are allowed on the Park Loop Road, on frozen lakes (be sure the ice is safe!) and on non-groomed carriage paths. Skijoring is prohibited. All dogs in the park must be kept on a leash no longer than six feet. Pet owners are required to remove all waste. According to MacDonald, most winter visitors so far have been respectful of the park and there have been no reported problems involving trash, waste, or resource degradation. In order to help provide information about visiting Acadia during the shutdown, FOA has published an updated (1.15.19) poster on its Facebook page and its website www.friendsofacadia.org.